With the arrival of May, I'm expecting to see a fresh start here at the Seven Days food desk. Between planning Vermont Restaurant Week, putting out the annual 7 Nights magazine and losing my longtime partner in crime, Corin Hirsch, I have never been busier than I was in April. In fact, I was so busy that I didn't find the time to blog about two major events that catalyzed Vermont foodies last month. 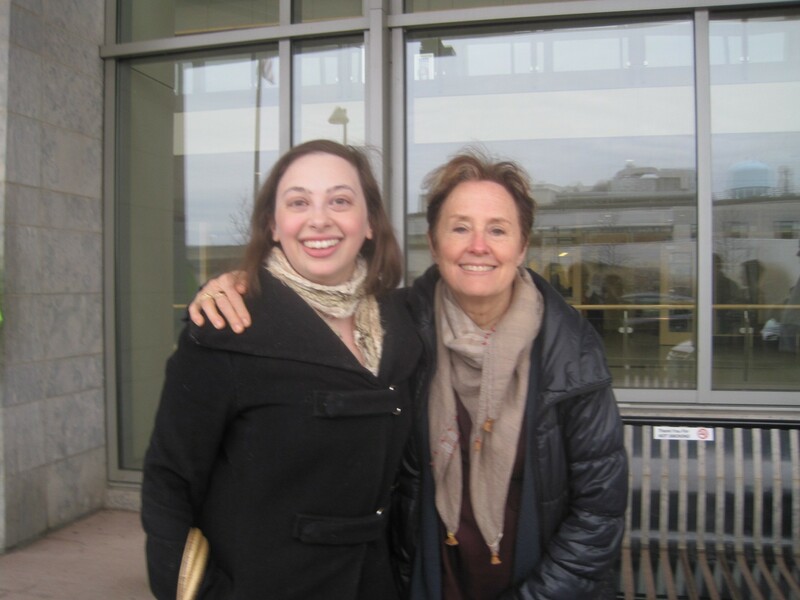 On April 3 and 4, Chez Panisse owner and Slow Food pioneer Alice Waters visited Vermont from California. Two weeks later, a pair of "Chopped" champions showed off their Food Network-tested skills in a culinary battle in Montpelier. As we venture into May and look forward to summer, I want to share some spring memories. As exciting as it was to meet Waters, lunch at Burlington's Intervale Center was also an enjoyable state of the union for local foodies to meet, greet and realize how far we've come. Waters sat next to Burlington Mayor Miro Weinberger and seemed to hit it off over a lunch prepared by noteworthy Vermont chefs including Molly Stevens, Maura O'Sullivan of Penny Cluse Café, Alison Lane of Mirabelles and Slow Food Vermont president Mara Welton. "This is how you do it. Just seduce it," said Waters when she thanked the crowd. "I call it a delicious revolution. it’s not hard. it’s like falling in love." 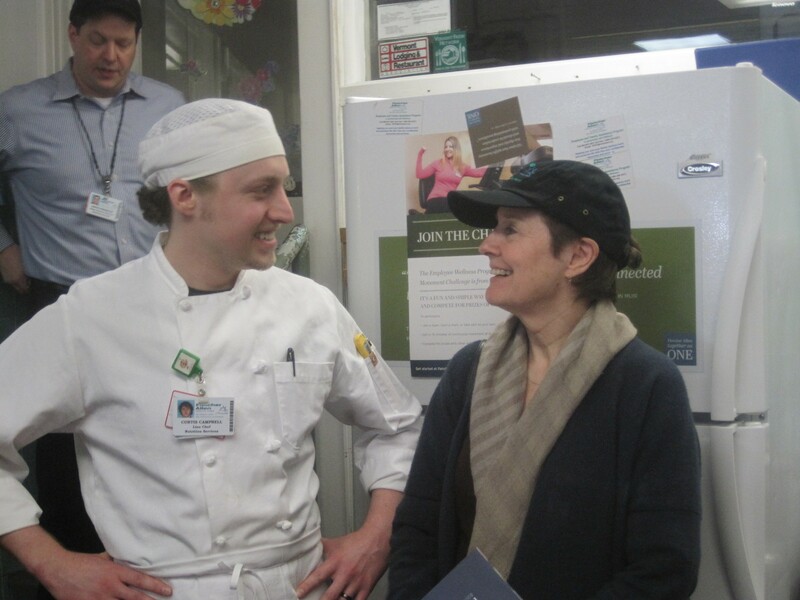 After lunch Waters headed to Fletcher Allen Health Care along with this reporter and Joyce Cellars and Travis Marcotte of the Intervale Center to see how her farm-to-table ethics are represented at the hospital. Waters was impressed with Fletcher Allen's use of local produce and partnership with the Intervale. The project is not unlike one she's currently spearheading in California, an extension of her work bringing farm-to-table programming to schools. "I think hospitals, because they’re taking care of people that are sick, can really be more radical than anybody else," she said. Waters recommended that the hospital pay more attention to labeling organic foods as such to educate patients and visitors. She also hoped that Fletcher Allen would add superfood smoothies to its bill of fare. "I think that would help patients heal," Waters said of the smoothies. "They can be very delicious with ginger and kale. A kale drink can be a powerful thing." 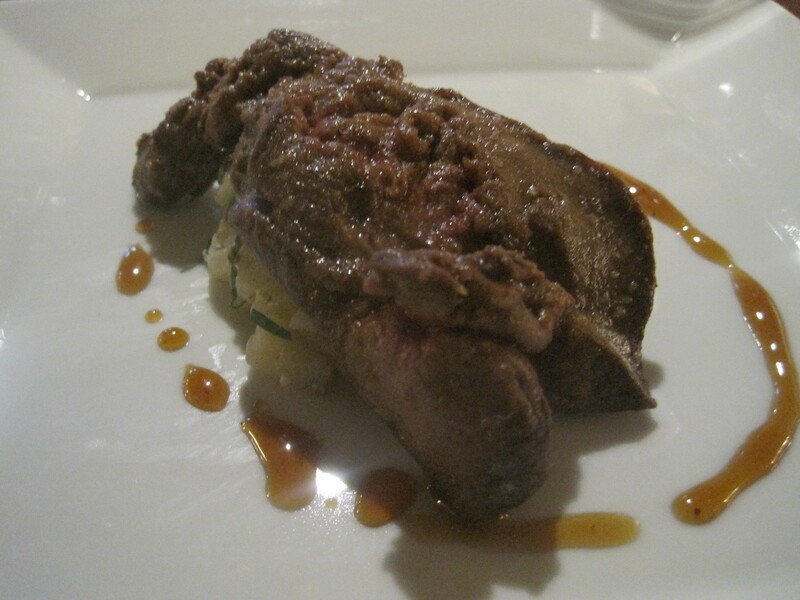 On April 12, I headed to the New England Culinary Institute in Montpelier to judge a competition between executive chef and COO Jean-Louis Gerin and his friend and fellow "Chopped" champion, Olivier de Saint Martin of ZINC and Caribou Café in Philadelphia. 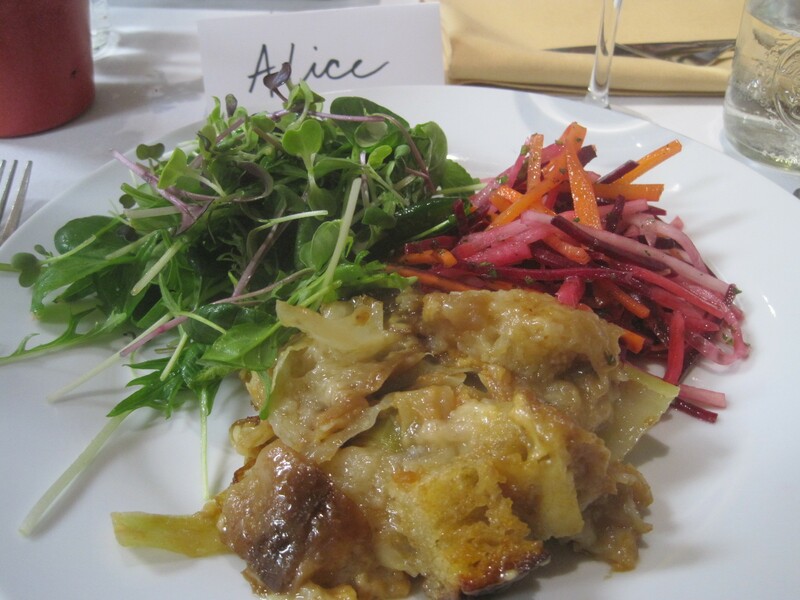 The pair competed by each cooking their winning appetizer from their Food Network appearance, then cooking an entrée using mystery box ingredients chosen that day. 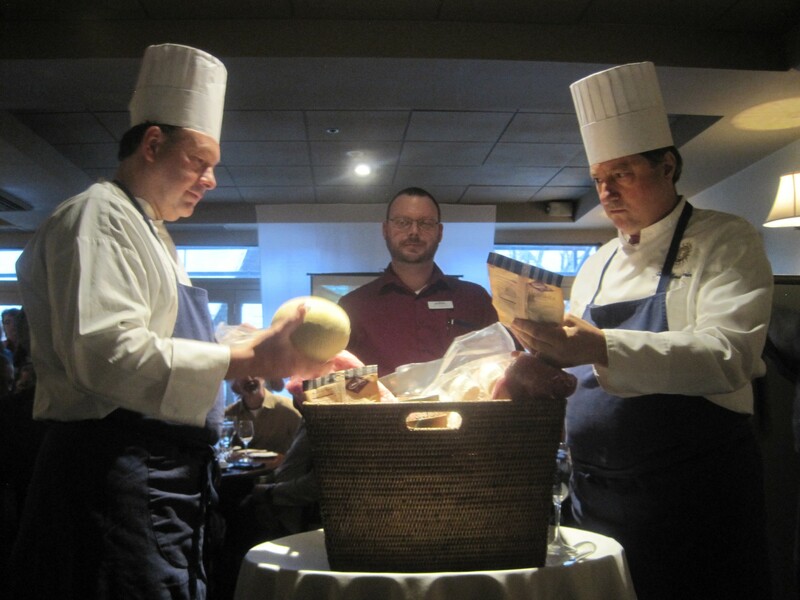 Saint Martin began with a mystery box of green papaya, blue cheese, duck liver and lemon drops. 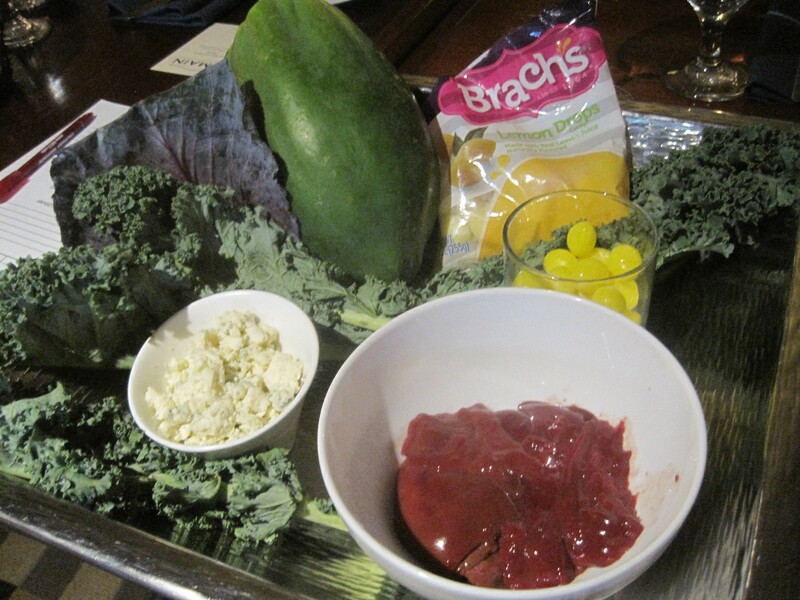 The result lacked acid despite the green papaya salad and sauce made from the lemon candy. 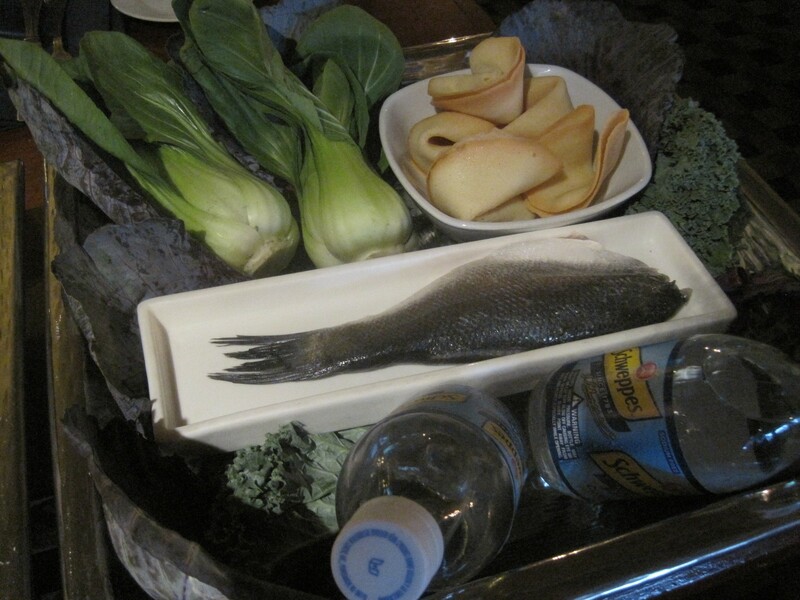 Gerin fared better with his combination of branzino, bok choy, seltzer and fortune cookies. 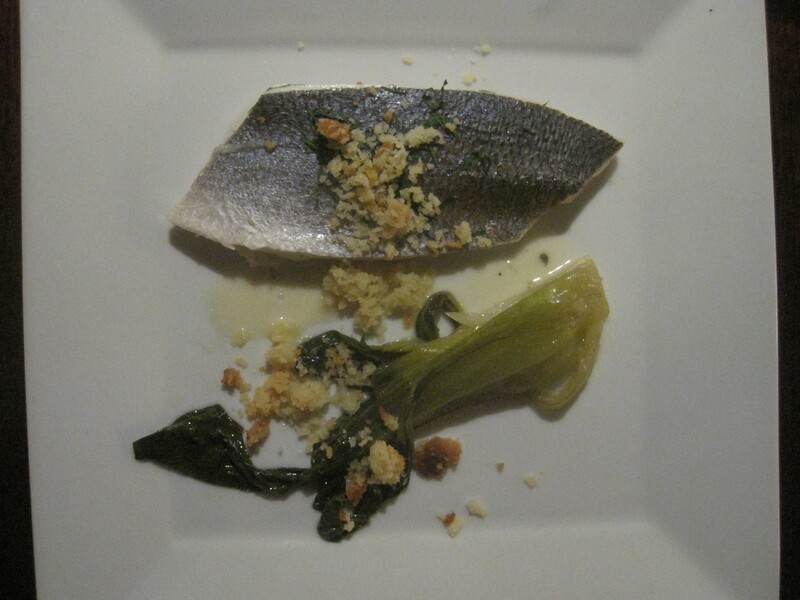 An elegant beurre blanc made from the seltzer illuminated the whole plate, topped with a crunchy crumble of fortune cookie. 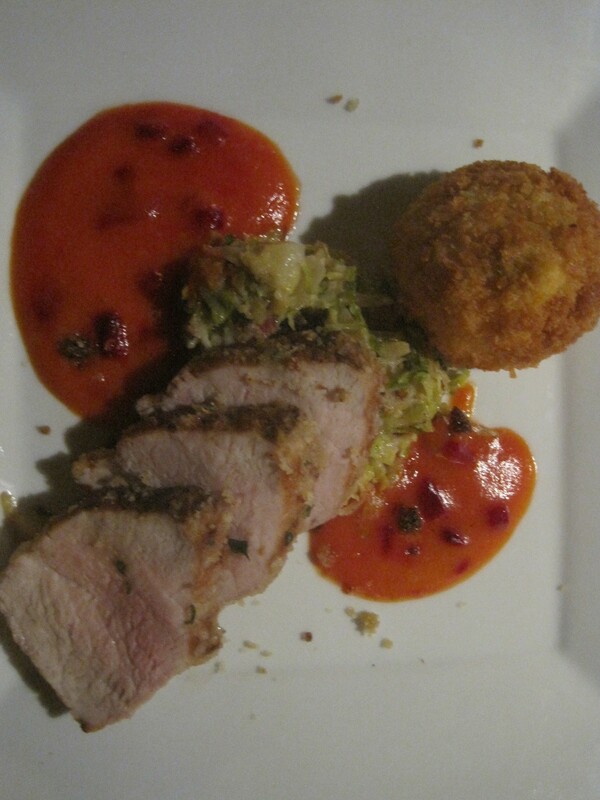 For the entrée both chefs had to use pork loin, cantaloupe, licorice, coriander and Vermont Creamery fresh crottin. In that case, Saint Martin triumphed with an addictive cantaloupe butter sauce, a hash of Brussels sprouts and bacon and a nugget of fried cheese. 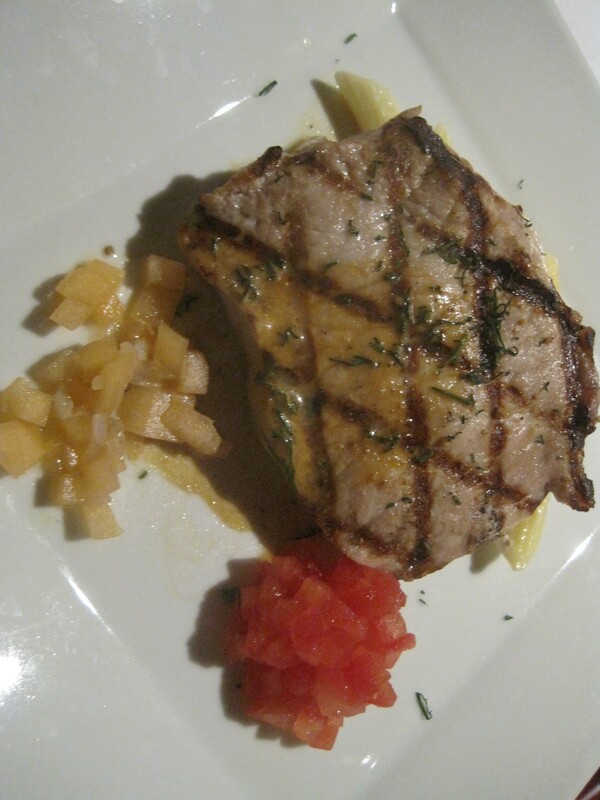 Gerin's pork chop was juicier, but though I adored his pickled cantaloupe with coriander, his crottin mac-and-cheese and tomato salad lacked flair. In the end, Gerin lost the competition by four tenths of a point. Seems close enough to warrant a rematch. 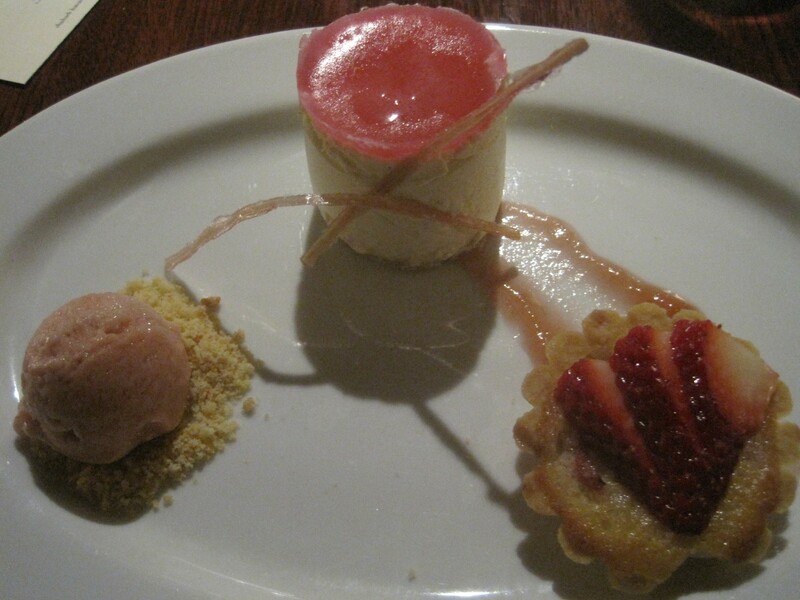 If I get to eat a dessert like the rhubarb trio below, I promise I'll be there.